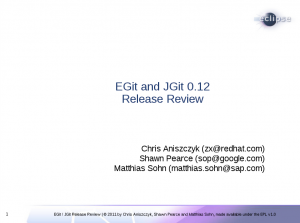 The EGit and JGit teams are proud to announce the 0.12 release! This is the last release before we wrap up development in early June and declare 1.0 in time for the Eclipse Indigo release. There’s a lot of stuff in the pipeline that didn’t make the 0.12 release so if you want to get anything in for the 1.0 release, please consider contributing by following our contributor guide. As always, if you have any questions in using the tools, please checkout the thorough EGit User Guide. Also, if you want the JGit maven repository, you can find more information here.